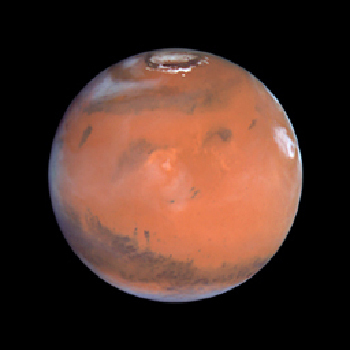 Mars has long been a target for manned missions, and recent months have seen several plans come to light. Scientists at Imperial College London have designed a concept plan to send a three-person team to land on the surface of Mars. The team would launch when Earth and Mars were best aligned for the shortest possible flight. Even then, the flight to Mars would take at least nine months, during which the crew would be subjected to zero-gravity conditions and cosmic and solar radiation. The Imperial team brainstormed ways to circumvent technological and environmental difficulties preventing humans from successfully landing on Mars. The first difficulty: Zero gravity. "Bone loss [in a weightless environment] is about 1-2 percent a month and if they're landing they'll be susceptible to fractures if they've got to be exerting themselves," explained Ryan Robinson, the Imperial team's physiologist. To avoid bone loss, the Imperial team theory-crafted a spacecraft that could produce its own gravity by splitting it into two sections: a habitation module and a Martian lander, connected by a 180-foot long cable. Each section would spin and generate enough centrifugal force to produce an artificial gravity that would mimic Earth's gravitational pull. The artificial gravity would gradually decrease during the flight, until it reached the gravitational pull of Mars, which is about 40 percent of Earth's. Additionally, radiation from the sun as well as outer space presents a challenge, but the spacecraft could potentially be outfitted with water to help absorb some of the radiation or, more fitting with the sci-fi nature of the plan, the ship could also don superconducting magnets to create a magnetosphere, which would deflect the radiation entirely. Once the team makes it to Mars, the lander would detach from the tether and land on the martian surface, while the cruise vehicle remained in orbit. The team would collect samples, plant flags, begin a galactic space war with aliens, and all those other things that astronauts in the movies do when they're the first to set foot on a planet. Once ready to leave, the team would disembark in a return vehicle that had been sent to Mars in advance, blast out of orbit and dock at the cruise vehicle for a triumphant 9-month journey home. The plan is loosely based on the backpacker's motto: Don't overpack; pick up things as you go. In that sense, the Imperial team suggests sending only a habitat module, a rover and a return vehicle to Mars in advance of the flight. The rover could mine the Martian surface for water, which could then be split into hydrogen and oxygen to fuel the return flight back to Earth. The Imperial Team's plan is a starting point, not the end game. It is intended to generate debate and ideas about how to tackle the obstacles involved in getting humans on the surface of Mars. "There are big, big jumps between a demonstration at one level and putting together the engineering systems for a mission, but they are engineering challenges," said Professor Tom Pike, who led the Imperial design team. "They are not fundamentally about making new discoveries."